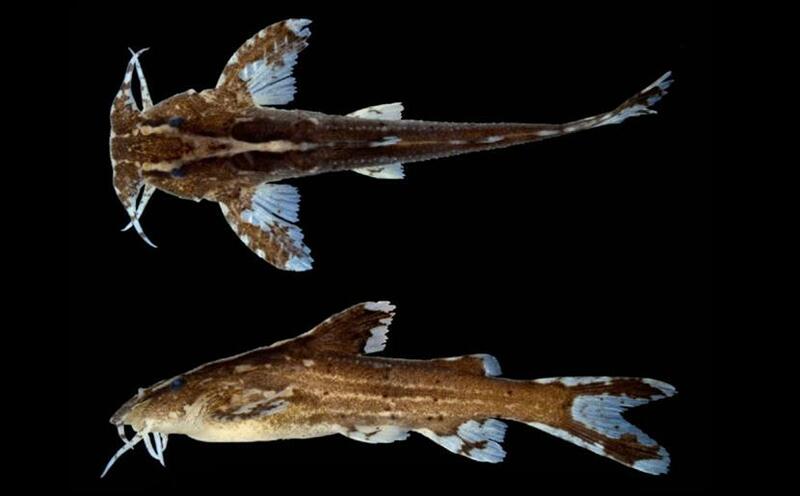 A new species of sisiorid cat fish named Pseudolaguvia virgulata was recently discovered from the Barak River drainage in Mizoram, a north eastern state of India. This new finding is published in Zootaxa (25/6/10) by Dr Heok Hee Ng, Raffles Museum of Biodiversity Research, Singapore and Dr Lalramliana Assistant Professor, Department of Zoology, Pachhunga University College, Mizoram. They mentioned that members of the sisorid genus Pseudolaguvia are small catfishes found in rivers draining the sub-Himalayan region and Myanmar. They superficially resemble miniature species of Glyptothorax in overall morphology and in having a thoracic adhesive apparatus with a median depression, but can be distinguished in having prominent postcoracoid processes. Dr Lalramliana told the reporter that eleven species of Pseudolaguvia are considered valid so far and with this it becomes twelve. The new species can be distinguished from congener's in having a brown body with two or three narrow, pale longitudinal stripes and a pale Y-shaped marking on the dorsal surface of the head. Dr Lalramliana highlighted that fish fauna in Mizoram is poorly documented and credit should be given to Dr Tawnenga, Principal Pachhunga University College as he is the one who gave support to document the fish fauna of Mizoram which is undertaken by Department of Zoology of the institution.